According to the Centers for Disease Control and Prevention, drug overdose deaths are increasing in the United States, with the majority of those overdose deaths (more than six out of 10) involving an opioid. Alarmingly, over 91 people die each day from opioid overdoses. Law enforcement officers are often the first on the scene to find someone overdosing, and as a result, many of those who use substances find themselves involved in the criminal justice system. The National Center on Addiction and Substance Abuse estimates that nearly two-thirds of the nation’s 2.3 million inmates in jails and prisons have a substance use disorder (SUD). Financially, according to a 2016 study published in Medical Care, opioid misuse, abuse, dependence and overdose resulted in $7.7 billion in criminal justice-related costs – nearly all borne directly by state and local governments. Arresting, prosecuting and incarcerating individuals with SUDs does not address addiction and the demand for prescription drugs and illegal substances. Treatment and rehabilitation are the keys to reducing substance use, health care costs and recidivism. For every dollar invested in treating someone with a SUD, four dollars will be returned in health care costs and seven dollars will be returned in law enforcement and other criminal justice costs. 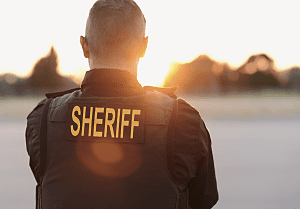 Sheriffs and police officers across the country who recognize the extent of the problem are implementing innovative programs that focus on treatment of the underlying SUD as a long-term solution. Approaches include the use of naloxone, access to treatment, treatment upon entry, access to medications approved for the treatment of opioid use disorder and assistance with insurance coverage. Many jails are electing to use their own budgets to facilitate these programs. Case County (Fargo), North Dakota Sheriff Paul Laney believes that individuals who commit crimes should not get a “free pass” merely because they have a SUD, but “if it’s a nonviolent crime, and they can be sentenced to treatment,” they will be in recovery and are not going to commit further crimes to feed their habit. In Pulaski County (Waynesville), Missouri, Sheriff Ron Long drafted legislation allowing all sheriffs’ deputies to carry and administer naloxone to reverse overdoses. Sherriff John Fuson of Montgomery County (Clarksville), Tennessee co-authored two bills with legislators; one created a program allowing the sheriff or chief jail administrator to implement a program that treats SUDs for those who are incarcerated, and the other created a pilot research program to determine whether SUD programs in jails reduce recidivism and increase cost savings. Based on the ANGEL program in Gloucester, Massachusetts, Charlotte County (Punta Gorda), Florida Sheriff Bill Prummell instituted the Addiction Recovery Initiative, where anyone with a drug addiction can approach a sheriff’s deputy on the street or walk into any county facility, relinquish his or her drugs and ask for help in obtaining treatment, without fearing arrest. Sheriff Parnell McNamara of McLennan County (Waco), Texas joined other law enforcement leaders in lobbying their legislators to pass a law that would suspend, rather than terminate, Medicaid coverage for inmates, ensuring that their benefits would restart automatically upon release. Franklin County (Columbus), Ohio Sheriff Dallas Baldwin helped to create the county’s drug court program which, in two years, has already saved the county approximately $1 million and saved countless lives in the community. McLean County (Bloomington), Illinois Sheriff Jon Sandage developed a program in which jail staff helps inmates enroll in Medicaid so that upon reentering the community, they have health care coverage, helping to prevent relapse. This program is being replicated in a number of jurisdictions across the nation. Since law enforcement has found itself on the front lines of the drug overdose epidemic, officers have had to shift their priorities to address the fact that untreated substance abusing offenders are likely to continue their criminal behaviors as a result of such drug use. Law enforcement has learned that providing treatment is smart on crime, not soft on crime. Sheriffs and their staffs are contributing to a nationwide movement to get inmates the treatment they need, resulting in an overall reduction in costs and recidivism and in saving and rehabilitating lives. Sarah L. Kelsey and Susan P. Weinstein are Consultants to the Center for Lawful Access and Abuse Deterrence. The not-for-profit organization coordinates a comprehensive national effort to prevent prescription drug fraud, diversion, misuse, and abuse while advancing consumer access to high-quality care for pain, addiction, and other health conditions. For more information, visit http://claad.org/.